This is our most popular outside application. 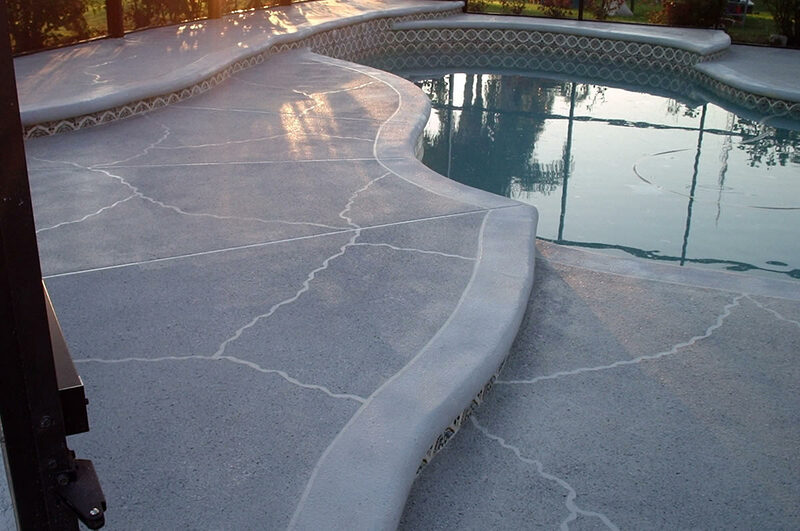 Great for any residential or commercial application where a highly decorative and non slip coating is desired. Beautiful and durable this truly color integrated system has a look that is all its own. This, like any of our systems, can be fully customized during the design phase to make it unique to your environment. 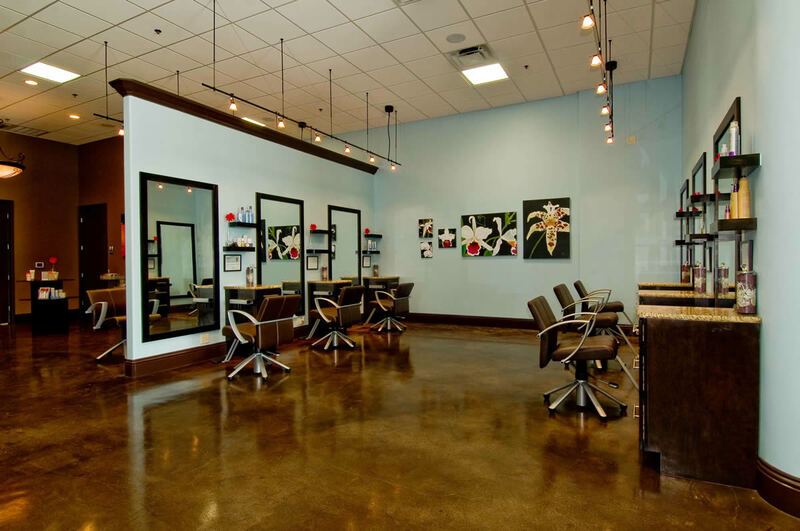 The options that come with Concrete Textures Color Integrated Spray Texture System are colors patterns, and texture. There are many colors and patterns from which to choose. It can also remain seamless with no pattern. The choice is totally yours. Custom logos can also be incorporated into the system. Our non fading colors and shades are endless. Colors can also be speckled to give the appearance of granite. A knockdown finish is also possible to give a little less texture and create an island type look. We then finish it all off with our super tough sealer to protect it from weather and chemicals and to keep it looking fresh and new for years to come. Our Stone Texture and Stamped Systems is the perfect choice for those wanting the look of natural stone, slate and granite but not wanting to pay the price. It is true that real stone is very expensive to purchase and also to have installed. Concrete Textures can give you the same look, with even more options at a fraction of the cost. Stone Textures can be used anywhere that a customer wants more than ordinary. It is perfect for residential and commercial environments. Interior and exterior. Specific applications are c interior floors, pool decks, porches and patios, drive ways and sidewalks. Stone Textures can also be applied to vertical surfaces such as back splashes, fire places, shower surrounds and even walls. There is no limit to the versatility of our Stone Texture System. There is no limit to what can be created with Stone Textures. The system can be hand troweled to create a unique swirling effect or stamped to recreate stone impressions such as Blue Stone, Monster Slate, Old Granite, and Italian Slate. Once the process begins, it can either remain seamless, be imprinted with a pattern, have taped tile patterns, cut into tiles or diamonds of any size or even hand carved to give the most realistic impression of grouted stone. You can even help during this part of the system to get exactly what you want. Any of our permanent colors can be added and then highlighted with additional colors for a rustic, antiqued look. Stone Textures can also be grouted just like you would fill the joints of real stone. Top this off with our super tough sealer to keep your new investment looking great for years to come. Concrete Textures Broomed Finish System is the ideal system for the customer that is looking for a standard broom or brushed finish to resurface their ugly concrete. Our Broomed Finish System is just as durable as the rest of our systems but with a more traditional concrete look. This system can also bring beauty to any environment with the addition of one of our non fading colors. It is as simple as selecting the color during the design phase. The color is permanent. It will not fade, peel or scratch. The system is then finished off with our super tough clear sealer to protect your new investment from dirt, stains, oils, ice melts and other contaminates. At any point years down the road, we can simple come back to clean and put on a fresh top coat to make your Broomed system look just like new. Typical places that would use this system would be residential and commercial concrete sidewalks, patios, driveways and pool decks. This system is a perfect option in housing developments and condominiums that have a HOA in place and want to keep all residents happy by keeping things simple. Our Metalic Epoxy System is the most unique interior coating available. It is the hottest flooring trend for residential and commercial customers. It doesn't matter if you are looking for rustic, contemporary, country or even institutional; this is the system that can accommodate you. 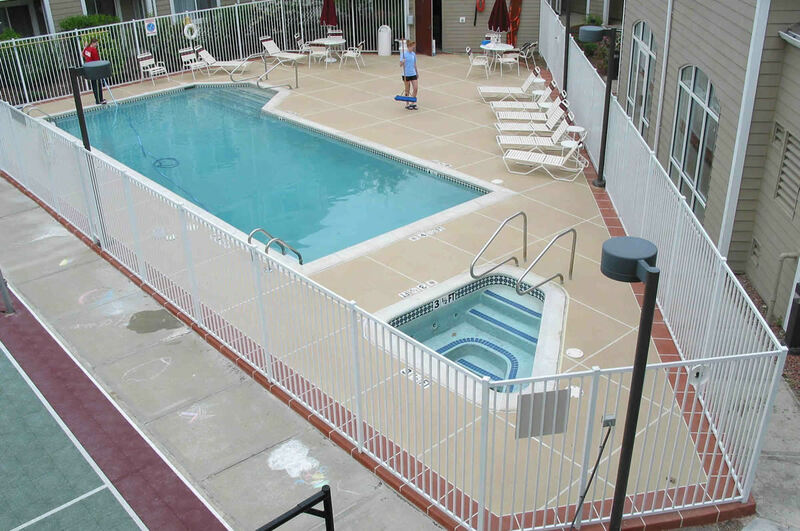 Metalic Epoxy Systems are completely seamless and water proof. It is scratch resistant and chemical resistant. It is as durable as it is beautiful. We have many colors to choose from. These colors may also be blended for a marbleized effect. This is the most popular option among our customers. Metalic Epoxy Systems are comprised of natural, mica powders and clear epoxy. This is a very "green" system. It has no voc's and virtually no odor. Making it very earth friendly. This system can also be applied over almost any substrate such as concrete, wood and metal. Typical places that a customer would have the Metalic Epoxy would be residential homes, restaurants and pubs, office buildings, night clubs and department stores to name a few. If you are looking for an alternative to traditional flooring surfaces, Metalic Epoxy is for YOU! The most appealing system available as far as durability, aesthetics, and speed for return to service is by far our Polyaspartics Systems. This system is comprised of colored acrylic flakes for the decorative portion and an 85% solids polyaspartic top coat for the durability needed using patented polyaspartic technology. This allows this system to be installed in most cases, in as little as 1 day. Concrete Textures Polyaspartics System can be installed over almost any substrate such as concrete, wood and metal. It can be applied over horizontal surfaces as well as vertical surfaces. When installing this system as a floor coating, it can also be run up the wall 4-6 inches at the same time taking care of your base molding all at once and making your floor completely waterproof. This makes it an ideal system for restaurant kitchens. Other places that would benefit from this system would be counter tops, walls, floors, fire houses, grocery stores, veterinarian clinics, residential and commercial garages, show rooms and hospitals. It is a perfect solution where any durable coating in needed. The customer is able to choose almost any color or blend of colors to go along with their current surroundings. After that, just kick back and watch it happen. Concrete Textures Polyaspartics Systems can be installed in extreme temperatures down to minus 30F and you can still walk on it in as little as 4 hours. Residential garages can easily be completed in one day meaning you only have to park your vehicle outside for one night. Copyright 2015 Concrete Textures Inc. / All Rights Reserved.